Every Thanksgiving dinner deserves a beautiful table setting to accentuate the festivities! Whether you�re hosting a large Thanksgiving party with lots of friends and family members or you�re planning on having an intimate gathering with your loved ones, finding the unique decorations or the perfect tableware to present your delicious Thanksgiving dishes is essential for any festive get-together. Let this year�s Thanksgiving feast be the one to remember with our intricate Japanese tableware collections such as the Pale Blue and Earthen Crackled Sand, the Turquoise Sky and Earth, and the Rustic Dark Green, Blue and Cream Karakusa collections. A matching tablerunner that compliments the tableware will complete the perfect Thanksgiving dining table. 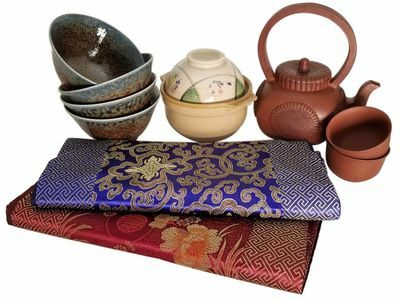 You can share your favorite tea or enjoy a sip of sake with your loved ones using one of our stunning designed tea sets and sake sets. If you are planning to be the chef for this year Thanksgiving feast, our wok sets and sushi related cookware might be what you need to create the most delicious dishes for your friends and family. Also, don�t forget to check out Mrs. Lin�s Kitchen Youtube channel for some quick-and-easy recipes. Lucky Bean Cake Taiyaki" Maker"